BANGI, 21 Oct, 2012 – An engineering geologist and government advisor on highlands development expressed concern that some housing developers were cutting corners and using inexperienced consultants to inspect their projects. Engineering Geologist, Professor Dato’ Dr. Ibrahim Komoo said this was happening due to the critical shortage of engineering geologists in the country. He said demand for such experts has become critical with the increasing number of houses built to meet the rising demand for homes especially those built on hill slopes. Prof Ibrahim, said this in an interview with UKM News Portal after being conferred Prof Emeritus by Pro-Chancellor Tunku Laxamana Tunku Naquiyuddin Ibni Almarhum Tuanku Ja’afar at the 4th Session of the 40 convocation of The National University of Malaysia (UKM) today. A former Professor of Engineering Geology at UKM and has been the Principal Fellow at UKM’s Institute of Environment and Development (LESTARI), he said the country now have only about 20 engineering geologists where as it needed at least 200 qualified consultants due to the current pace of development in the construction sector especially housing construction. He said fresh geology graduates would not be able to make a proper assessment of the situation but the developers do not have much choice. Prof Ibrahim also cautioned developers from building on steep man-made hill-slopes because there is not enough research done on such terrain in Malaysia to warrant the approval of some projects. He noticed that Malaysian engineers were still using data compiled by research institutes in Western countries where the climate and soil structures are completely different. As for whether heavy rains are the main cause of hill-slope failures in this country, he explained that the weather and climate should not be blamed because they are consistent. The fault lies in the construction firms’ or developers’ preparation of the slopes, usually done without adequate consultations. Prof Ibrahim, however, agreed that downpours were becoming more common due to climate change and could exacerbate flash floods and landslides. But he said most landslides occurred where hill-slopes had not been properly cleared. This might indicate some unethical practices but he was not sure to what extent. He said Malaysia is still a developing country and needs to learn more about soil science of tropical countries and called for the setting up of a Gelogical Research Institute. 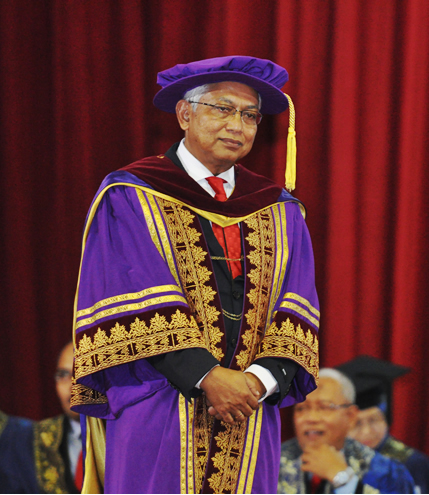 Prof Ibrahim obtained a Bachelor of Science (Hons) in Geology at UKM. He pursued his Doctorate in Geological Engineering at Strathclyde University, Glasgow. He spent 37 years at UKM as a student and lecturer, 19 years of which as Professor of Engineering Geology. He is a scholar, researcher and a driving force behind sustainable development for the preservation and conservation of natural resources and the environment as a valuable heritage for future generations. He is currently the Vice Chancellor of University Malaysia Terengganu.